Tronc is reportedly gearing up for a sale, but executives won't say a word. 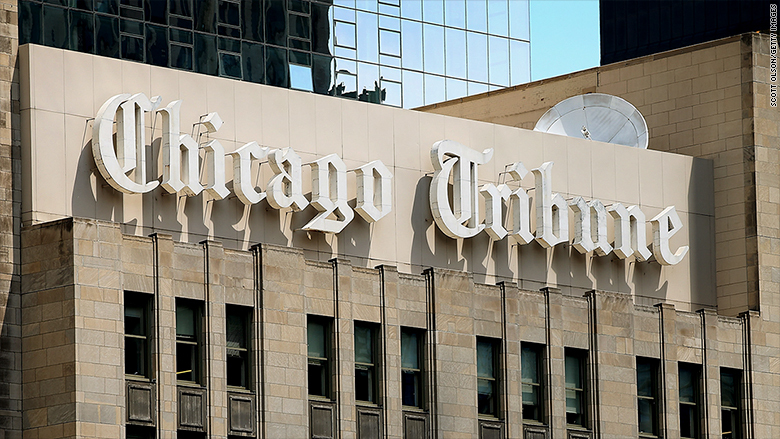 The company, which owns the Chicago Tribune, the New York Daily News and several other newspapers, reported its second quarter earnings on Thursday. It posted total revenue of $253 million for the last three months, a 3.9% increase from the same period in 2017. But those figures were overshadowed by reports this week that Tronc could be up for sale. The Tribune reported Wednesday that Tronc is "weighing an offer" to sell its newspaper holdings to a private equity firm. On Thursday, Reuters reported that the investment firm Donerail Group was in talks to acquire the company. A Tronc spokeswoman declined to comment on the reports. And the company remained mum on a conference call with analysts on Thursday. "The company is aware that reports have been published about Tronc being in discussions about a possible sale of the company," Aaron Miles, the head of investment relations, said at the outset of the call. "The company has a longstanding policy of not commenting on market rumors. And hence, we will not entertain questions regarding those rumors during the Q&A portion of this call." Shares of Tronc stock are up more than 17% since reports that the company could be exploring a potential sale emerged Wednesday. The stock closed at $16.96 on Thursday. It has been a turbulent year for the company, which has been rocked by a series of unflattering headlines. Tronc announced in February it was selling the Los Angeles Times and the San Diego Union-Tribune following an acrimonious standoff over Times staffers' formation of a union. In March, Michael Ferro abruptly stepped down as chairman of the company, hours before Fortune magazine published an investigation into claims of sexual harassment against him. Last month, Tronc laid off half of the Daily News staff. But the company offered a rosy outlook to investors on Thursday, saying that the sale of the two California newspapers, which closed in June, significantly reduced pension liabilities. And with regard to the Daily News, which has faced enormous financial struggles in recent years, Tronc CEO Justin Dearborn spoke as if the tabloid would still be under the company's purview. "Our focus is to return that business to profitability by the end of this year," he said on the call.